I’m still having difficulty with breakfast in the morning, especially since the last few weeks have been increasingly hectic, making morning moments for sit downs in front of food virtually impossible. Those muffins have been great, though a little on the messy side for someone as disaster prone as myself. Honestly, you can’t take me anywhere. So what does one do? 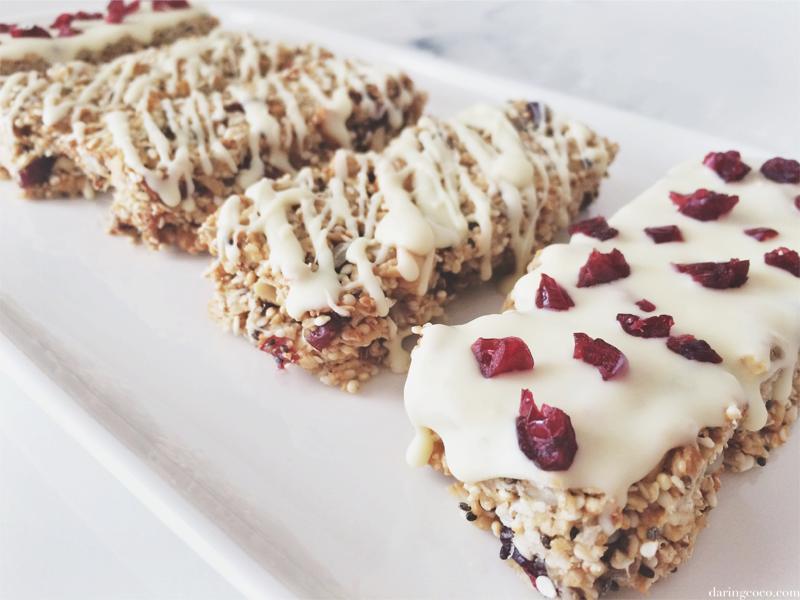 Well, one needs to get even more creative and in doing so attempts to reinvent granola bars, with some much needed help along the way. There are many types of food that I’d hope to master in my lifetime. Dishes like lasagne (don’t laugh) or pastry in general. 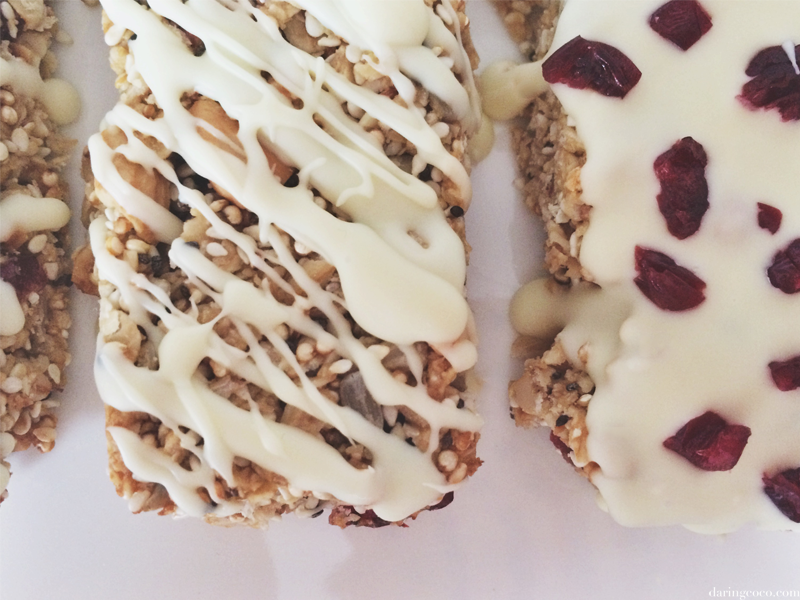 Granola bars or muesli bars as we call them in Australia, have only recently made it onto that ever expanding list. I blame it on their new found “superfood” status. Thing is, I expected this recipe for granola bars to be fairly idiot proof. You mix a bunch of seeds and nuts with dried fruit together, then add a paste like substance to bind it and that is it. No that is not it; at least not for me. 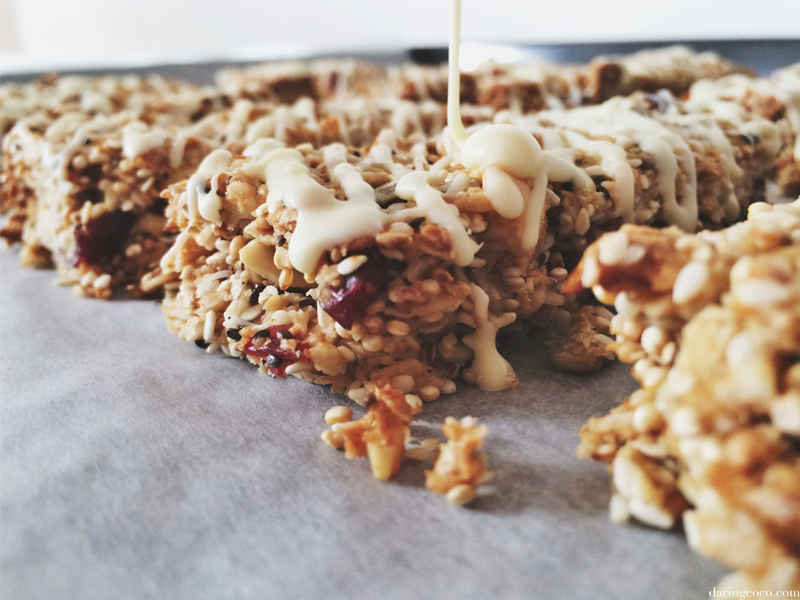 Because that attempt saw my bars turn into a crumbling hot mess of healthiness. There were sesame seeds here, chia seeds over there and pepitas somehow ending up on the couch. My delightful little concoction did not turn into yummy, chewy bars that held their shape. But all was not lost, for I used yoghurt to top and bind that fragile wreck instead. Sonia 1, Kitchen Gods 0. 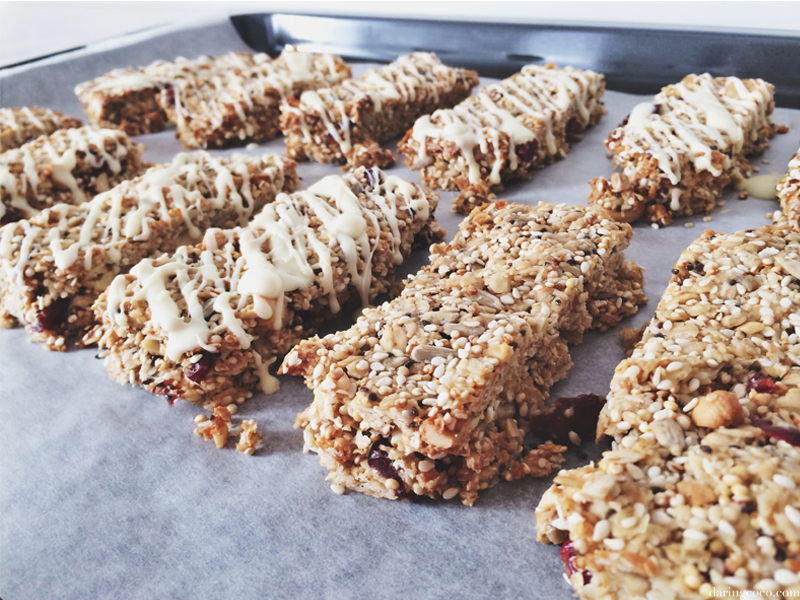 I did not let that epic disaster deter me from making granola bars in the near future. I turned to other seasoned bakers for some advice like the Half Baked Harvest whose blueberry, yoghurt master piece had been sitting idle in my Pinterest folder for eons. And thus came up with this; a medley of healthy bits and bobs I had stored away in the pantry. I also wanted chocolate in there somewhere, because chocolate, and decided to toast the tops of my granola bars for a little crunch and much needed colour. So the second time round, these little buggers turned out marvellously. And let’s just say breakfast is slowly becoming something I can digest. Preheat oven to 180°C // 350°F and line a rectangular baking tray with baking paper. Combine oats, puffed quinoa, sesame seeds, coconut, pepitas, cashews, cranberries, chia seeds and sea salt in a bowl, mixing well. Using a separate, microwavable bowl add the peanut butter and honey and microwave for approx 30 seconds or until mixture is smooth and runny. Add the vanilla extract and incorporate fully. Add the peanut butter mixture to the dry ingredients and mix well then transfer to baking tray making sure to press down firmly and even the top. Place in freezer for around 60 minutes to harden up. Bake for around 10 minutes or until the top has turned golden brown. Allow to cool then cut into 2cm wide rectangles. To make the topping, melt chocolate in a microwave or bain-marie and transfer to tops using a metal spoon to either cover the entire bar or to drizzle haphazardly over. While chocolate is still soft add the chopped cranberries to decorate.